The Suveran Uptide 9ft 9" Boat Rod has a 30ton Carbon blank making it one of the stiffest uptider rods on the deck today. It also has a captive reducer that can be adjusted in length for casting or retrieving, making it a truly universal rod. High level uptide rod for saltwater fishing, developed by Nordic Pro's. This Suveran uptide rod with surprise you thanks to the high quality finish and of course thanks to the technical components and blank used to build this rod. 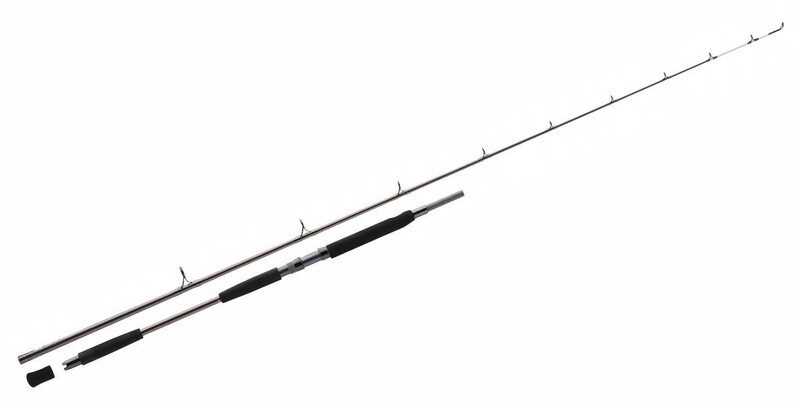 The Suveran uptide is 9ft 9" in length, 5-10oz casting weight, Fuji guides, 2 piece uptide rod. This uptide rod has plenty of strength, excellent responsiveness with a sensitive tip for detecting bites. The Suveran has a great strength, allowing you to easily cast large weights and traces packed with bait. This rod is great for hauling in large cod, conger and rays with ease. Overall, The Suveran Uptide fishing rod easily handles large cod baits and strong tides, it maybe the best uptide rod you ever own! Awesome rod, great for uptiding for Cod. Awesome rod, great for boat fishing. Caught plenty of large Cod with my Abu Suveran. FREE Delivery on all Abu Garcia Uptide Rods over £100!! !